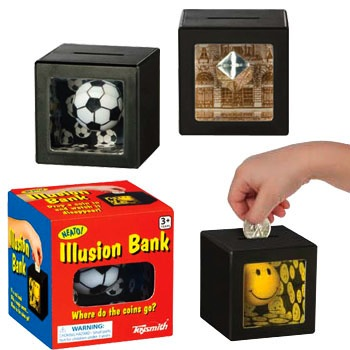 These cool little cube banks have two illusions. First, an object seems to float behind the viewing window, then each coin you drop through the slot seems to mysteriously disappear! Banks measure 2.75 inches and come in three assorted styles. *Price per item. Styles subject to availability.